The Perseus cluster is a massive galactic cluster consisting of thousands of galaxies. It is often a focus of study because it is both massive and reasonably close (about 240 million light years away). Recently we’ve discovered some interesting x-rays coming from the region. The results have been published the Astrophysical Journal, showing there is an unexplained emission line in the x-ray spectrum. The research actually focused on plasma surrounding the cluster, where the team observed x-ray spectra looking for emission lines from various elements. By observing these lines and their strengths, we can determine the composition of the plasma. But because x-ray spectra can be faint, the team added together 17 days worth of observations. This is similar to the way photographs of the night sky are often made by adding together a series of short exposures to create a bright and detailed image. After adding all the observations, the team found known emission lines from various elements, but also found an emission line at 3.5 keV that doesn’t correspond to a known element. This kind of spurious line can appear in summed spectra for a few reasons, such as instrument noise or glitches from the way data is processed, so the team first made sure these weren’t the cause. The signal remained, so it appeared genuine. After this first discovery, the team found the same emission line in dozens of other clusters that were observed with different x-ray telescopes. So it seems clear this is a genuine signal. Since this emission line isn’t caused by known elements, what could it be? One obvious choice is dark matter. A large supercluster such as Perseus should be loaded with dark matter, and the interaction of dark matter particles could produce such a line. It has even been proposed that this x-ray line could be similar to the 21cm line of hydrogen, such that the presence and strength of this line could be a measure of the amount of dark matter in a region. But it hasn’t been confirmed that this is, in fact, a dark matter signal. One of the problems is that various dark matter models could produce such a signal, so its existence does little to distinguish one model from another. 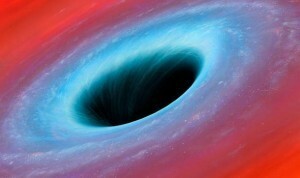 Another problem is that alternatives could also produce a signal, such as colliding black holes. 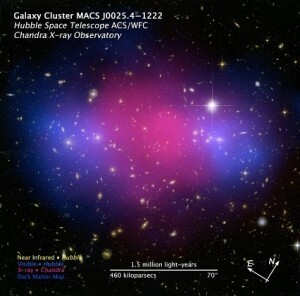 Right now, the alternatives seem less likely than dark matter, but they can’t be ruled out. So once again we have a hint of dark matter without conclusive evidence. I thought dark matter did not interact with light. how can it have an emission line? why isn”t the line seen everywhere always? Hi richk ! You’re correct of course, dark matter doesn’t interact with light but what’s believed to of been detected here is the decay products of dark matter annihilation. In their paper Bulbul et al speculate that what they have detected is a sterile neutrino decay emission line.Sterile neutrinos are a candidate for dark matter and their decay would produce a photon and an active neutrino. It is these decay products that are said to be creating the emission line. Why isn’t it everywhere ? The short answer is that it is everywhere. The research identified this same emission line in 73 different galaxy clusters. so is not the bigger story the fact the sterile-neutrino-as-dark-matter theory finds support in the observations? Where do things stand in further testing that theory? And specialthanks for responding to my original question.